This is long and high forest ridge that divides the Arun and Tamur valley in the eastern Nepal. We can start trek from Basantapur or Tumlingtar and make a trek about 7 – 14 days up this ridge, which offers views of Makalu (8463m) to the west and Kanchenjunga(8586m world’s third highest peak) to the east. The Milke Danda ridge eventually ends in some high peaks, so we have to retrace our route back down Chainpur and ending the trek at Tumlingtar or Basantapur. There are huge forests of rhododendrons along the ridge. Specially Milke Danda is the popular area in Nepal, where we can see many different kind of flowers including the Nepal’s national flower rhododendrons. Have a trek in spring and you can get attractive prospect. Starting from: Kathmandu by bus Basantapur . 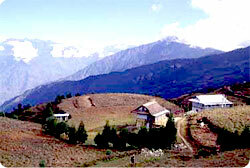 Ending at: Suketar to kathmandu by flight or by bus from Taplejung. Himalayan sights: Mt. Kanchanjunga Himalaya range . Day 01: Arrival in kathmandu 1334m, Himalaya Journey Treks & Expedition’s representative will transfer to hotel , Milke dada trekking briefing with officially arrangements. overnight at Kathmandu. Day 02: After breakfast HJT tour guide will take to you half day sightseeing in kathamndu & prepare for the Milke dada trekking. Day 03: Kathmandu by bus to Dharan. Day 04: Dharan by bus Basantapur. Day 08: Acclimatization in Milke dada and Excursion.